(MCT)—Gearing up to go back to school can be hectic. It can take some time for families to feel comfortable with their new schedule. Starting the new routine before school begins can help families ease back into the school year. These simple tips will get you on the right track for a smooth transition for both parents and kids. 1. Create a morning routine so that everyone shares the same schedule. Consistency helps each family member know who is doing what each morning. It shouldn’t be a surprise to your children when to eat breakfast or whose turn it is to shower. It should be clear that the expectation is to: brush teeth, shower, get dressed, eat breakfast, and get to school on time! 2. Create a family “command center.” Centralize a station for all your family’s coats, shoes, backpacks, and sports equipment near the door for easy morning access. Maintain a family calendar or pin board for family notes at the station. Each night have your children load their homework and projects at the command center for a quick morning exit! 3. Practice open communication with your family. Talk about your family’s routine every night and get everyone on the same page. Talk about what works and what does not work, and then make the appropriate adjustments. 4. Each night, have the kids select their outfits for the next day to make getting dressed easier in the morning. Hanging canvas closet racks with 5 slots are great for picking out outfits for each day of the week. Label each slot for Monday through Friday to make preparing weekly outfits a snap. Your children should never have issues with their morning wardrobe again. 5. Pack the family’s cold lunches the night before so it’s “grab and go” and out the door in the morning. 6. Get to bed early! A tired and cranky child only slows down the morning routine. 7. Being organized goes a long way. 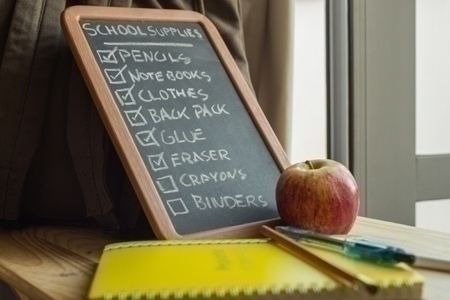 Make sure homework is done the night before, projects are ready for transport to the car or bus before going to bed, and everyone has what they need to leave the house. 8. Maximize use of a family calendar that all members contribute to. Have your children add in their after school events, upcoming weekend activities, family nights, and sports practice and games. Most importantly, talk about the calendar as a family to work through transportation scheduling before it becomes an issue. 9. Plan for family time. School schedules can take over your life and before you know it, there is no time to spend as a family. Insist on having dinner together as a family at least a few times a week and plan a family activity a couple of times a month so everyone stays connected. 10. The school year will be packed with lots of experiences to be shared as a family. Encourage your kids to get involved with sports and participate in clubs, but don’t sacrifice family time. Teaching kids to balance family and school life can be challenging. Lead by example and help them have a positive school experience. Most importantly, have fun! Be supportive and don’t forget to smile and laugh! Making school a pleasant experience will inspire kids to want to learn and get involved. Set goals for growth both academically and personally for each child. And finally, enjoy the moments of chaos and grow together as a family. Jennifer Chung is a parenting expert and co-founder of Kinsights: part parenting community, part online health record.